Rocky Mountain Soap Co. 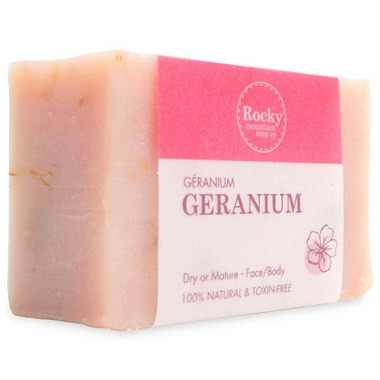 Geranium Bar Soap not only looks and smells wonderful but is a natural cleanser packed with regenerative Geranium oil that makes it an excellent moisturizer for dry or mature skin types. Calendula (Marigold) Flowers soothe and nourish dry or damaged skin. Rosehips are a natural source of antioxidants rich in Vitamin C and bioflavonoids and they help remove dead skin cells and brighten the complexion of the skin. Skin type: Dry or Mature, Suitable for: Face & Body. Rocky Mountain Soap Co. does not use palm oil, which is hard to find and very important to me due to the ecological/social impacts it has. This soap is super moisturizing and hard so it lasts in the shower without melting. Lovely, soft scent. I love this soap, it keeps my skin soft and smooth. One of my favourite soaps. It lathers up well, smells wonderful, and is very moisturizing. A good choice for the long winter months. Love this soap! It is very moisturizing and doesn't seem to melt in the shower. I will buy this again.